Both leaders said they were working jointly to find a "solution"
French President Nicolas Sarkozy insists that no EU "solution" will be imposed on the Republic of Ireland to break the Lisbon Treaty impasse. Speaking after talks in Dublin, he said there was "no misunderstanding" about a possible second Irish referendum. Irish voters rejected the EU reform treaty in a referendum on 12 June. 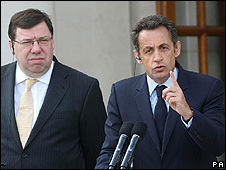 Mr Sarkozy denied having suggested that Ireland hold a new referendum. "I said at some point or other the Irish must give their opinion," he told reporters. "I never said Ireland had to organise a new referendum... I understand it's the Irish who must decide," he said, but added that "we're a Europe of 27". He noted that 23 member states had already ratified the treaty. He was addressing a joint news conference with Irish Taoiseach (Prime Minister) Brian Cowen, after their talks. Both leaders pointed to the European Parliament elections in June 2009, which they said would have to be held either under the Lisbon Treaty or the current Nice Treaty, which was designed for no more than 27 member states. Protesters asked: "So what does democracy in Europe mean?" Earlier this month, Mr Sarkozy was quoted as saying the Republic of Ireland would have to hold a second referendum on the EU treaty. The BBC's Jonny Dymond in Dublin says that reported remark annoyed many Irish politicians. 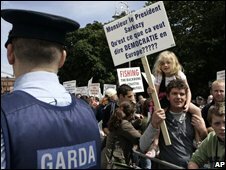 Several hundred anti-treaty protesters rallied outside the government building in Dublin during Mr Sarkozy's brief visit. The French president met not only Irish politicians but also business leaders and campaigners from the Yes and No camps in the Lisbon Treaty debate. Ireland was the only one of 27 EU member states to hold a referendum on the treaty, which is aimed at streamlining EU institutions to improve decision-making in the enlarged bloc. After the Irish No vote, Mr Cowen's government said it would analyse the reasons for the result and present its ideas at an EU summit in October. France took over the EU's six-month rotating presidency on 1 July. "We'll work together on this, there are no ready-made solutions," Mr Cowen told reporters on Monday. He plans to visit Paris in September for further talks with Mr Sarkozy on resolving the treaty impasse.